Debbie Grattan has leveraged her acting skills and talents over the past two decades into a very successful career as a professional female voice over talent. With a degree in Drama from UC Irvine, and several awards for her stage performances from the Los Angeles Times, Drama-Logue, and a Theatre Woman of the Year Award in Southern California, this Orange County native played nearly every stage venue in the Southern part of the Golden State, culminating with leading performances at the Tony award-winning South Coast Repertory Theatre and the Laguna Playhouse. As she loaded her resume with stage work, she was also finding the proximity to Hollywood and the television industry a draw, and won roles in episodics, TV movies, commercials, infomercials, and many other types of acting jobs, both live and filmed, as a corporate spokesperson. Debbie also found tenure as an actor with a decade of service to a comedy improv group, performing live interactive theatre, and honing her improvisational skills in thinking “off the page”. With a lifetime as a working actor, and over 20 years behind a microphone, voicing tens of thousands of scripts for many hundreds of satisfied clients, her customers have come to know Debbie as a female voice over talent who is professional, dynamic and able to deliver top quality reads across a wide spectrum of voiceover service applications. 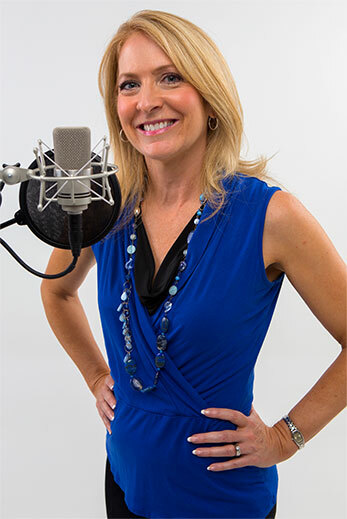 Debbie uses her warm, friendly voiceover style on everything from corporate narrations and training videos to Disney parkwide announcements to national tv and radio commercials. Debbie has worked with scores of well-known clients including BMW, Verizon, Microsoft, Samsung and HBO, seamlessly shifting between the conversational, the humorous and the dramatic. Debbie has trained diligently with respected experts in the voiceover acting field including Kalmenson & Kalmenson, Voicecaster, Marc Cashman, Joanie Gerber and Carroll Day Kimbel. Once you work with Debbie, you’ll understand what all of her other loyal clients already know. Debbie delivers — More than just lip service! Debbie now lives in Niles, Michigan with her husband, Paul Rarick, and two children. She enjoys the lovely scenery and seasonal changes of the Midwest, especially the beautiful west coast of Michigan. Her daughter, Natalie, is also an accomplished teen voice over talent and together they all love to attend touring Broadway shows that come through South Bend, Indiana and Chicago.